Another uneventful day, which started with a drive across Indiana on US 30. In Indiana, US 30 is just about always a four-lane divided highway; the towns are either to one side or have evolved around the wider road. The only place worth stopping at was the Fort Wayne Vietnam Memorial, a tank and American flag which upon closer inspection were installed in 1968...at about the same time that future Ft. Wayne Congressman Dan Quayle was hiding in the National Guard. Through the western two-thirds of Ohio, US 30 was even more like an Interstate. Not only was it a four-lane divided highway, but it had been re-routed around all sizable communities. The Ohio folks had even built Interstate-style rest areas every 20 or so miles...and when a detour sent me for 30 miles on other roads, these roads were similarly constructed. I don't think any other state has such an elaborate system of secondary roads...then again, Ohio has a lot of 25,000-person cities located 20 miles from one another, making a good system of secondary roads essential. 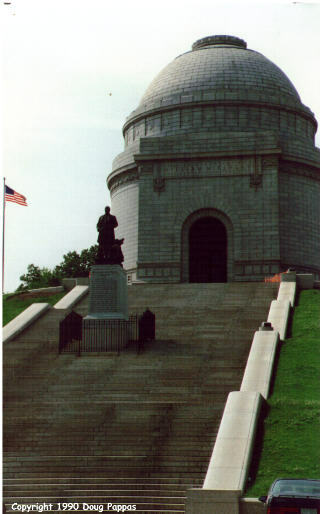 Stopped in Canton to view William McKinley's tomb, a huge domed edifice atop a hill. A plaque on the McKinley statue in front says that it was paid for by the donations of over a million children. Inside, McKinley and his wife lie in regal splendor. The McKinley tomb is immensely more elaborate than Lincoln's or Washington's, and comparable only to Grant's and Garfield's among those I've seen. At least Grant was a national hero; the most important thing either Garfield or McKinley did was die. Then detoured a little further north to the Pro Football Hall of Fame, a pale imitation of baseball's Cooperstown. The difference in settings says it all: Cooperstown is a picture-postcard village and its Hall of Fame looks like a library, while the pro football hall of fame features a hideous football-shaped building constructed 100 yards from the Interstate. The football Hall of Fame emphasizes NFL teams; baseball's emphasizes players. Of course, baseball lends itself much more easily to mythology, as I recall from the Field of Dreams... Stopped for the night in New Stanton, PA.